The Allure of Nymphets: JURASSIC PARK (1993): Nymphet Sexual Innuendo? JURASSIC PARK (1993): Nymphet Sexual Innuendo? I used to be a very naive person, but my naivety has waned since I began doing research on hebephilia\ephebophilia, and I wrote The Allure of Nymphets. I've recently become even less naive after reading Naiman's Nabokov, Perversely and Patridge's Shakespeare's Bawdy. However, I would like to get a second opinion on this matter. 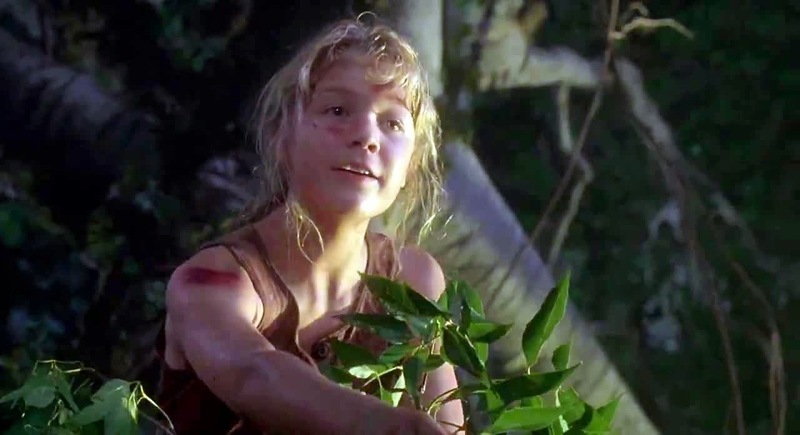 When a Vegasaurus happened upon Dr. Grant, Tim and Lex (Ariana Richards) in Jurassic Park (1993), Tim said, "It looks like it has a cold." However, since there are no visible signs of a cold, it's not apparent from the film how Tim was able to make that diagnosis. And why did Lex refer to it as a "girl", but Tim referred to the Vegasaurus as an "it"? Thus, my question is, did Steven Spielberg spew the rich viscous fluid upon Ariana Richards' 14-year-old face as a sexual innuendo or as an attempt at comedy or both? LOL I love this scene. She even spits some of it out! There's also a sideboob scene when she's in the car with the lawyer. There's no way that wasn't deliberate. Thanks for the comment and reference!